After an early morning tour of Kent behind Black 5 45305, we see 6201 Princess Elizabeth reverse across Grosvenor Bridge into Victoria station, then emerge at the head of the train, banked by 45305. The other shots are all from the East Coast Main Line: Welwyn viaduct, Essendine north of Peterborough, and Weston north of Newark. K4 61994 The Great Marquess should have been assisted by Black Five 45231, but she was failed a few days beforehand, so a WCRC class 37 diesel was coupled inside 61994 for the trip to Fort William. We see them leaving Stirling, close to Bannockburn battlefield, at the top of the climb approaching Crianlarich, and powering towards the summit at County March. 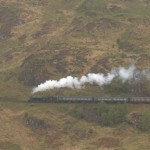 61994 The Great Marquess was in charge on the picturesque West Highland Extension. In typically changeable weather, we see her crossing Glenfinnan viaduct, at Morar, climbing away from Mallaig and skirting Loch Eilt. 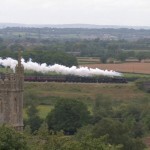 Black 5 44871 had hurried north to deputise for 45231 and provided the necessary assistance to 61994 The Great Marquess. Our cameraman deserves a medal for braving the torrential rain at County March, and for keeping the camera dry! It was dry but windy at Craigendoran, on the north shore of the Firth of Clyde. 46115 Scots Guardsman took over for the evening run over the West Coast Main Line, and we see her near the top of Clydesdale at Crawford and restarting from a water stop at Lockerbie. 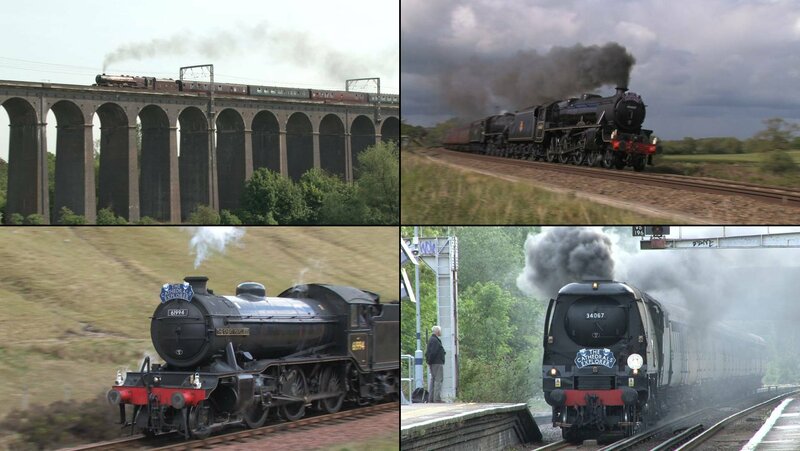 A pair of Black Fives, 45407 and 44871, took the tour into Wales. In dull and windy weather, they pass the Bridgewater Canal at Preston Brook and then hurtle up Gresford bank. At Baystone Hill, Condover and Dorrington, south of Shrewsbury, the sun comes out. 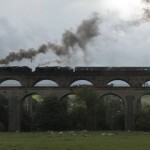 On the Central Wales line, we see the impressive Knucklas viaduct, complete with mock-medieval towers, and the stiff climb at Sugarloaf, exaggerated by a severe speed restriction a mile from the summit. At Manordeilo, the train is accelerating from a level crossing, and again at Ffairfach. Finally, as the light fails, the train crests the summit at the site of the old Derwydd Road station. 45407 and 44871 were in charge again for the run up the Great Western. We see the viaduct near Morlais from two angles, a platform shot at Pyle, and the Bishton Flyover (carrying the line to Llanwern steelworks). Back in England, having come through the Severn Tunnel, the train is stopped at Pilning, and makes a slow climb past Cattybrook to the tunnels at Over. It’s back up to speed by Westerleigh and Chipping Sodbury on the Badminton line. Our cameraman is lucky at Cholsey that a passing goods train has a few empty wagons marshaled behind the loco. 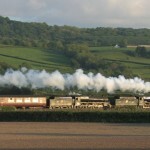 The schoolboys practicing cricket by Moulsford bridge appear not to notice the appearance of two steam locos. Back in London, 44871 has left the train, and 34067 Tangmere has been attached to the rear, ready for the evening circuit of Kent. 45407 drops off the back of the train after assisting from Victoria station. Finally, Tangmere raises the echoes at Bickley station.